. : Publication date :: Reads: 6476 :: :: :. Anticipation of new albums in the year 2007 has taken on a new dimension. 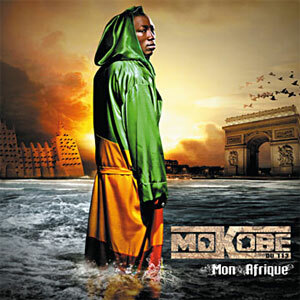 Months prior to the release of French-Malinese rapper Mokobé's new cd, the cover graphic could already be seen as the profile image of his many friends on the Myspace community. The first tracks off the album were immediately shared - and massively downloaded - through the web and there was even a video with a track 'Paroles de Soninke' that in the end was not even included on the album but still had 80.000 views on the website booska-p.com. The other single C'est dans la joie, a crossover coupé-decalé-rap tune that became a hit on French radio. What's the fuzz about? Mokobé Traoré, better known as member of the French hip hop crew 113 (who sold half a million copies of their first album) and the Mafia K'1 Fry collective (also see the African Armure clothing line), has decided to dedicate an album to his west-African roots. We have seen French-African emcees looking at their heritage before, most notably Bisso na Bisso (Congo), a project initiated by Congolese-French rapper Passi in 1999, and Disiz la Peste who recorded an entire album under his real Senegalese name: Serigne M’Baye Gueye. Both albums featured lyrics about life on both sides (Africa and Europe) and the search for identity of the generation of youths from African parents who grew up in the North. They experimented with a fusion of local sounds and French hip hop, creating a new sound in the process. 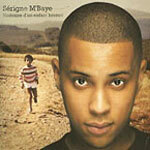 In a way, 'Mon Afrique' looks more like a compilation than a solo album. Every song is a collabo with a big name in African pop music. Youssou n'Dour to Patson, Seun Kuti to Tiken Jah Fakoly, they are all here. Rather than just hip hop-ifying the different styles that Mokobe's guests bring along, often Mokobe is more like a guest of the people he works with, as he adapts coupé decalé, Ivory Coast's dance music on C'est dans la joie, and on Malembe (featuring Fally Ipupa from Kofi Olomide's band) it's as if you are listening to a Congolese rumba track. On 'Profitez' featuring Youssou N'dour, the beat samples a 1970's classic tune from Etoile de Dakar, Youssou's first band. While the album is musically very diverse, the raps of Mokobé provide the necessary binding factor. Most of the album lyrics are French, apart from the guest spots - though Viviane N'dour (until recently she was Youssou's sister-in-law) tries her English: 'welcome to Africa' and even a word of Swahili. To those who - like us - are less than fluent in French, the album is interesting mostly because of its sonical diversity: where else can you hear Malinese musical legend Salif Keita singing over a 808 beat? The pure afrobeat collabo with Fela Kuti's son Seun is another treat. 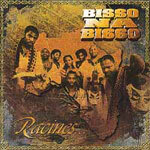 Previous African-French projects have not been widely available outside of France (with the exception of the Bisso na Bisso album). Even Mafia K1fry, the collective that Mokobé and 113 are part of, are hardly known outside of the French speaking zone. Let's hope that 'Mon Afrique' gets the distribution and promo it deserves. If not, you can still order the album online, for example through Fnac (at 12,99). 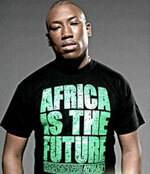 For 4 euros more you also get a 'making of' bonus dvd including the Paroles de Soninke video, and Crackedz.com have a better deal still as they throw in a free 'Africa is the future' t-shirt (as Mokobé wears in the picture above).